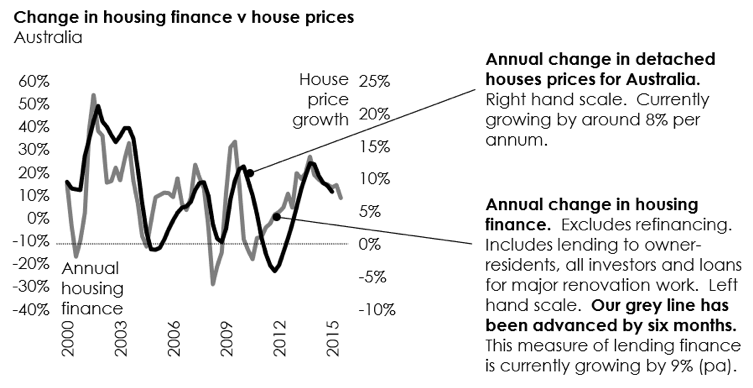 To understand the property market, you need to understand what’s happening with credit, and it’s moving quickly. Martin in Melbourne asked an interesting question about what impact changes in the credit market are having on the property market. I’ll have to leave the international story to another time, but I’ll take a quick look at what’s going on in Australia, because it’s actually quite interesting right now. As I’m sure you’re all aware, APRA (regulatory body for the banks) started cracking the whip in the middle of last year, trying to whip the banks into better shape. Essentially, they were a bit concerned that their lending to investors was growing too quickly. In response the banks increased lending requirements and lifted interest rates, and generally made it a tad tougher for investors. One of the most striking charts I saw last year was this one. It shows how much maximum borrowing capacity has been reduced, for someone on $100Kpa. 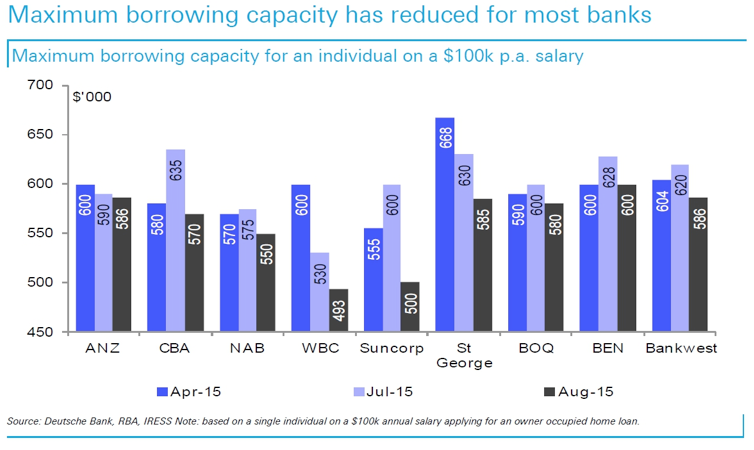 At Westpac, borrowing capacity fell over $100K! And all these measures seem to have done the trick. UBS report that investor credit growth has fallen from a peak of 11.1% p.a in June, to 8.5% in December. Credit matters. A lot. You’re ability to buy a house is determined by your wealth (deposit), you income (serviceability), and leverage (how much you can borrow). And so APRA’s position went straight to the leverage part of the equation. When banks started tightening the credit screws, people rightly expected that it would take some of the wind out of the property market. And to a degree, it did. Partly it seems to have led to some creative box-ticking. As the chart from UBS shows, investor credit fell in the September quarter after the changes came in, but it was almost entirely compensated for by a boom in owner-occupier credit. Any reclassification story aside, this seems to have had an impact on credit overall (investor and owner-occupier combined.) 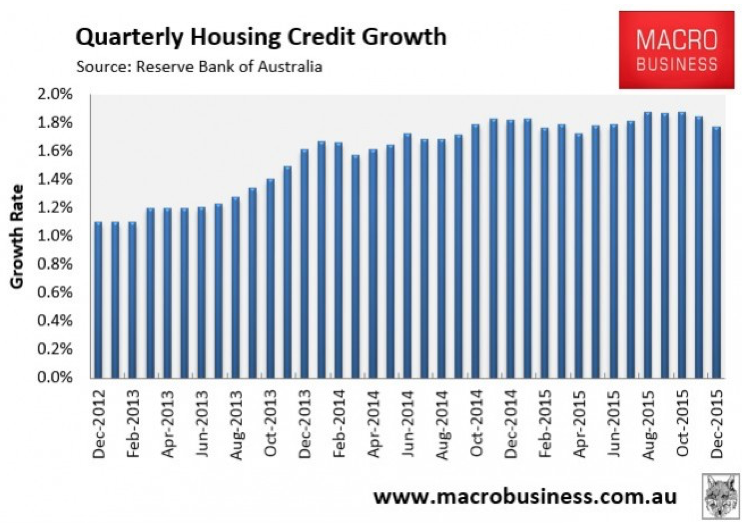 Housing credit growth has fallen from around 1.8% a month, to about 1.6%. The trend is clear, but credit growth remains elevated, just not as pumping as it was before. And the slowdown in credit seems to be continuing into the new year. The CoreLogic Mortgage index has fallen off a cliff in recent weeks, though there’s always a seasonal dip around Christmas. It was just a bit more severe this year. The real question now though is, where to from here? If credit continues to decline, then we could expect to see slower price growth. That said, credit has a long way to fall before things get ugly. Credit growth at current levels, even though its come off in recent months, still points to pretty solid conditions. And it does line up pretty well. But eye-balling this chart, it still suggests that we’re looking at price growth of around 6-7%. So again, the vital question is what happens to credit growth from here. Well, what’s APRA’s position? They drew a line in the sand at 10%. The banks promptly jumped over it and set up at 8.5%. At the end of the day, APRA’s probably happy. And that means the banks are probably going to start gearing up their investor businesses again. That will be a key tell. And want to know a secret? “Lenders ease conditions for property borrowers” ran the headline at the Australian Financial Review last week. Though surprisingly, no other major daily has picked up the story. “Lenders are easing rates and conditions for borrowers in the lucrative investment property market following six months of tougher terms in response to regulatory concerns about excessive risk. Fourteen lenders have increased loan-to-value ratios, others have slashed investor rates by up to 30 basis points, and new products are being launched priced for additional risk involved with investors. And this is the thing. The tighter conditions were artificial. Banks wanted to lend and borrowers wanted to borrow. And mortgages are profitable business. If the line in the sand is 10%, then banks will want to be as close to that line as possible. Right now, they’re 1.49pp short. So is it too soon to call the turn in the credit cycle? I’d want to see a bit more action yet, especially from the majors who have the biggest mortgage books. But the signs are there. And because we’re talking annual growth rates, we need to wait until the strong start to 2015 washes out of the numbers. My feelings is that banks will be a lot more relaxed in the second part of the year. But it looks like the APRA measures have had the desired effect, which means that the market can get back to business as usual… sooner or later. Things are sluggish now, but the pause could well be short-lived. Any mortgage brokers out there getting a sense of easing conditions? How has it all been affecting you and your strategy?